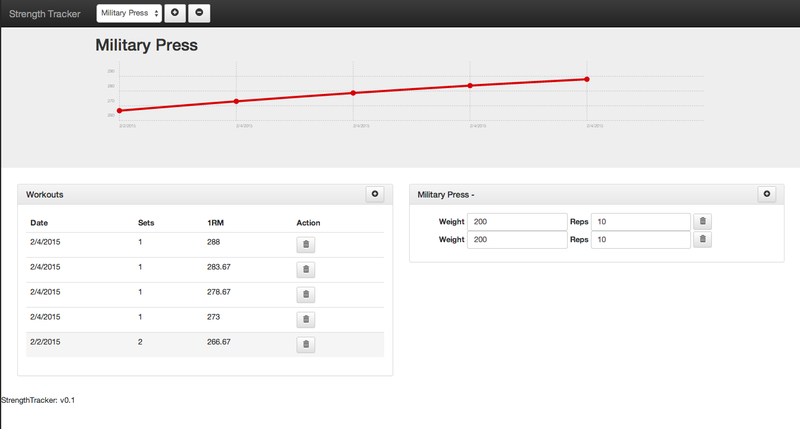 I've got strength-tracker basically functional, using the MEAN Stack (Mongo, Express, Angular, Node). Still some stuff I want to do with it, but I figured I'd pause for some reflection on the technology and effort so far. I came in thinking I would need to write directives for things like charting and modals, but I found that what I needed and more were available and free, and I could easily install them via bower. I had seen a conference talk on Chartist and figured I'd try it out, and immediately found an angular project on github for it, which essentially required me to just create a json object for chart details and save it to scope. Same thing when I needed a bootstrap modal. I immediately found that there was a Bootstrap directive integration. Angular has an active and thriving open source community around it. If someone needs a directive that's not around, it looks like they just create it and throw it on github. With Angular, you bind your widget directly to the model, so that your screen updates whenever you change your model, and vice versa. I've built this into apps before, but having this natively cooked into the framework saved lots of time and code, and worked nicely for the strength tracker app. There's no save button implemented, so whenever the user updates data onscreen, the save happens in the background and the chart dynamically updates. This was all done with very little code. My plan is to put the app out publicly where folks could use it or just play, but I wanted to add a couple of twists before getting it there. Of course getting an app working is usually the easy part - the bear is the last 20%. Overall, I was impressed with how little code the MEAN stack required me to code to get my site going. Also, I didn't run into any perplexing issues (though the complexity level of what I was doing was relatively low). Things were pretty straightforward, and I got things up and going with a fair amount of ease. The solution hit two biggies for me: low amounts of boilerplate code, and nice testability. I wouldn't mind creating more stuff with it, though I have some other options I'm itching to try first.